October 15 of each year is National White Cane Safety Day, a day the Council takes to advocate for and educate about the White Cane Law. Since 1964, the day has promoted safe, welcoming communities for people with vision loss or blindness. The White Cane Law encourages the year-round independence of people in the blind and visually impaired community, creating a sense of empowerment and improving public safety. 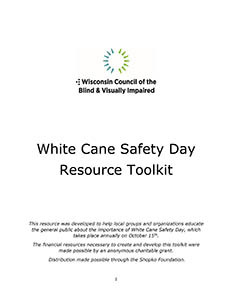 Thousands of blind and visually impaired individuals around the state of Wisconsin use a white cane for mobility and safe travel. Check back for a countdown to next year's event. Check this page as the day gets closer for ways you can get involved and bring awareness of the White Cane Law to your community.